We could lose trees more than 5,000 years old to climate change. 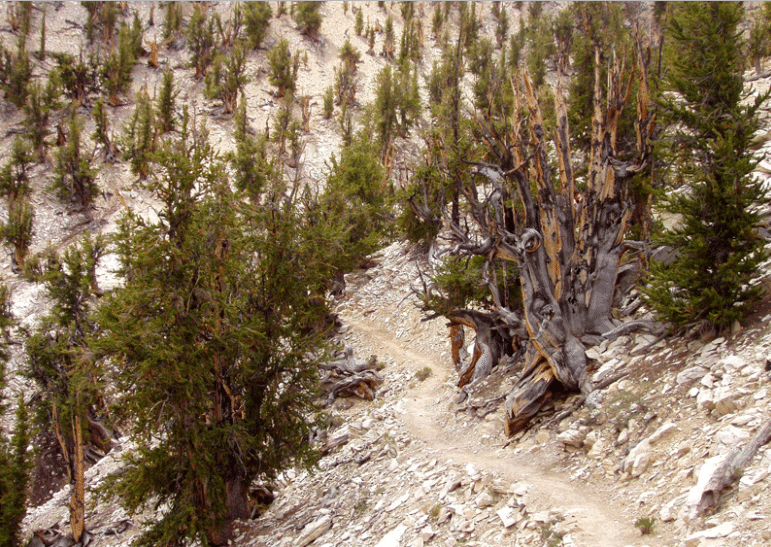 At 4,845 years old, Methuselah, a Great Basin bristlecone pine (Pinus longaeva) in the White Mountains of California, is one of the oldest trees on Earth. It’s so old, in fact, that it was only a seedling when the Egyptian pyramids were being constructed. Since it first broke ground, the pine tree has survived wars, cultural upheavals, extreme weather conditions, and whatever else this world threw at it. Now, after more than 48 centuries of life and history, this tree is facing its toughest challenge yet: climate change. Around the world, giant, old trees like Methuselah stand as a living history of this planet, but a new study suggests that climate change could lead to their extinction. “I think what’s going to happen — at least in some areas — is that we’re going to lose bristlecone,” said Brian Smithers, an ecologist at the University of California and co-author of a recent study of the iconic forest giants. As these limber pine trees grow, they could use up the light and water supplies that the slower-growing bristlecone pines that do sprout in the higher elevations need to survive, eventually taking over those higher elevations completely. The bristlecone pines left in the lower elevations could then succumb to the warmer, less desirable conditions brought on by climate change. The loss of our planet’s oldest tree species isn’t exclusive to the bristlecone pine. According to an article published by ThinkProgress back in 2012, leading ecologists have already “documented an alarming increase in the death rate of trees between 100 and 300 years old in many of the world’s forests, woodlands, savannahs, farming areas, and even in cities.” As a response, researchers are urging an increased focus on efforts that can help us identify the cause of this rapid loss of historic trees so that strategies can be immediately implemented to manage its effects. A more recent study published in Nature World News looked into how the growth rate of trees changed historically under previous climate conditions. Those researchers projected that the United States will see a 75 percent decrease in its growth rate of trees in the southwest, and as the planet gets warmer, this will push numerous forests into critical levels as early as 2050. When that happens, our forests will be unable to help protect us from the effects of climate change by offsetting carbon emissions. Combine this negative impact on the planet’s tree species with the ever-increasing number of other plants and animals facing extinction, and you can see that humans are far from the only species battling the devastating consequences of manmade climate change.